The Bed and Breakfast Villa Goethe is located directly in the historical centre of Agrigento history. Of the Bed & Breakfast, you can quickly and easily reach to the main tourist sights. 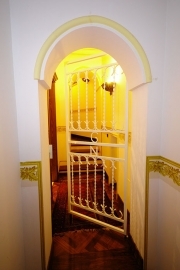 The charming and friendly holiday accommodation is ideal for those who wish relax and culture at the same time. Imagine, you open the window and you’ll be surprised by the fresh scent of lemons, oranges and grapefruit. We offer an elegant and luxurious holiday accommodation with antique furniture and wooden floors made of real walnut. The five rooms dispose all the amenities including a private bathroom, TV, and Internet access. We belong to the first to have opened their doors to tourists who want to know the traditions of our beautiful country like up close. The owner of the antique building, in which we live is none other than Baron Celauro, one of the most famous and noble lords of Agrigento. In this historical building Celauro has created space for travellers visiting the city of temples, including those prominent guests, such as the German poet Goethe and Emperor Franz Joseph W.. Following our Bed & Breakfast was able to house ambassadors, celebrities, business travellers, lovers of art and culture, or may also accommodate tourists just. In our Bed & Breakfast there is a beautiful and typical Sicilian garden with oranges, lemons, grapefruit, pomegranate, jasmine and other fragrant herbs, which are typical for our Mediterranean area. In the midst of these colours and scents, on mild spring days or on sunny summer days, we’ll serve you the breakfast consisting of typical products of our country.